Thanksgiving is my favorite holiday. What’s not to love? Friends and family come together, filled with appreciation for one another and for the gifts that life has brought us, and to share a harvest meal. 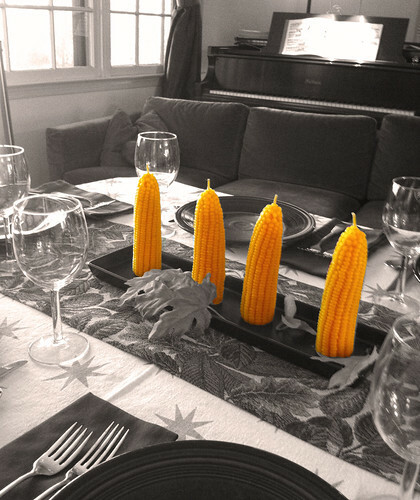 This year we’re expecting twenty-one guests for dinner, from local and from faraway locations. The kids are home, and my living room is scattered with suitcases and instrument cases. I can’t wait to see everyone else later today—it’s going to be great. Right? Well, I’ll tell you the one thing I don’t love about Thanksgiving: the timing. I teach at a college so I'm keenly aware that Thanksgiving arrives, awkwardly, only a few weeks before the end of the fall semester. Just when they are in the thick of preparation for finals and final papers, my students drop everything and journey home for a warmth-filled weekend of family, food, and—hunching over a laptop writing that philosophy term paper due on Monday, no extensions, no excuses. And they are the lucky ones: many students are not able to go home to their families because it's too far to travel. Or because their families can’t afford for them to trek cross country only a few weeks before winter break. So they wait out the holiday, alone and lonely in the dorms or at the home of a roommate. But that brings me to a point that many families don’t weigh strongly when making college and conservatory decisions: geography. It might seem short-sighted to include a college’s setting as a factor in a choice that will have such long-term career ramifications, but location does merit a second thought. If the school you’ve chosen is situated thousands of miles from home and, perhaps, not on a direct flight path, or perhaps ninety miles from the nearest airport, and with little in the way of nearby public transportation, then life is going to be tougher, and more expensive. That is: life will be tougher and more expensive four to six times a year. Is worth it? How will you get there? How will you get your stuff there? How and where will you store all that stuff over the summer? Students who live within driving distance have a huge advantage because their families can deliver them (and their stuff) to college in the fall, and then deliver it all back home again at the end of spring semester. Everyone else has a logistical problem, and a bill for storage fees. When colleges estimate your Cost of Attendance (COA) they factor in transportation, but this one-size-fits-all number is all but meaningless when you are trying to buy an Amtrak ticket at holiday prices or fly your kid cross country for his sister’s wedding. All four of my daughters looked at colleges throughout the US, and, by coincidence, three of them picked schools that were within polite driving distance (which I define as under two hours) from home. One chose a school in a midwestern city, about a 7-hour drive or a $400 plane fare. Not bad, by contrast to what many families endure, yet the logistics of moving her back and forth and getting her home for holidays was still daunting. After two years when she transferred to a different program that also happened to be close to home, her dad and I were secretly relieved. For those of you in the college-application process, good luck getting those pre-screens and applications uploaded by Sunday, December 1st. Enjoy your family time and try to imagine what it will be like this time next year. Happy Thanksgiving! Karen, I’m not a parent and usually I skip reading anything to do with kids, but I can’t stop reading your parenting blogs simply because they are so well-written and full of good tips that we can all benefit, with or without children. I’m very thankful!